Communicating the nuances of exoplanet discoveries to the public can be difficult, especially when the headlines all seem to be proclaiming the same thing. 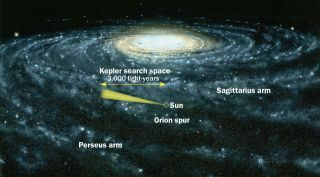 In this artist’s concept of our Milky Way galaxy, the [relatively narrow] extent of Kepler’s search is depicted. At the 2012 Astrobiology Science Conference, Astrobiology Magazine hosted a plenary session titled: "Expanding the Habitable Zone: The Hunt for Exoplanets Now and Into the Future." Originally formulated as part of our "Great Debate" series, this panel of exoplanet hunters and thinkers held a lively discussion about some of the most important issues facing the search for and understanding of alien worlds orbiting far-distant stars. In part nine of this "Hunting for Alien Worlds" series, the panelists explore the sticky relationship between exoplanet research and the press. David Grinspoon: Let's open this up to the audience. Audience: What is the relationship now and in the future with exoplanet hunters and the SETI Institute? Eric Ford: The SETI Institute is a private foundation that does what it wants to do. And NASA and NSF funds various things they want to do and at times they collaborate. There are many people who work at the SETI Institute who are part of the NASA/Kepler science team. And there are also parts that are independent. So it's a marriage of convenience when they have common goals. Audience: Linda Billings, I am with the School of Media and Public Affairs at George Washington University in Washington and working on communication research for the Astrobiology program. My expertise is communication, not biology or chemistry or physics or astronomy. And I was just furiously scribbling notes in this part three of your discussion. You all here and elsewhere at the conference and other sessions that I've been attending have been talking about how important it is to understand and explain the context for the data that you're examining. And this is an issue in speaking with a non-expert audiences. And I still cringe every time I hear somebody say "the public" because there is no such thing as "the public" to a social scientist. There are many many different kinds of publics that we need to be aware of that all the times. Sara has very politely alluded to the individualist nature of some of the leading exoplanet searchers and how this may add to confusion about communication. Part of the context in explaining any kind of news is the research that you have built on in making your discoveries, in making your advances. And it’s not peculiar to exoplanets searches at all, I think that's a problem. Also, whether we like it or not, we have to accept that there's a process for getting out news. Whether you're a government agency or university or an independent research institution. Where things get not more and more clear as an announcement works its way up the ladder of approval, but more and more fuzzy. And I have certainly observed this at NASA. And so you're always going to have headlines. So there's not a whole lot that we, the science community, writ broadly, can do about changing deeply embedded journalistic conventions and practices in news values. I think it would benefit us to understand them a little bit better and figure out how to work with them, rather than feeling we always had to keep our dukes up. "Oh, they're going to do it again." Because you know there's a lot of ways in which this happens. In this community we joke about every time you put out a press release. There could be a thousand words in a release, and there are three hundred words in-between the word life and the word Mars, and the headline would be "Life on Mars." Same thing for water on Mars. We keep discovering liquid water on Mars, over and over and over again. And what happens certainly in a press release, because of the need to be brief, is that the context is left out. So I just think we need to try harder to put a little context into every announcement we make. Whether we are standing up at at a science conference or not. David Grinspoon: Any thoughts about how we can do a better job about it? I think Linda expressed it pretty well. Okay, thank you. Yes? Audience: Meryl Irwin, University of Massachusetts. I wonder what the panel thought about the claims from some of the micro-lensing experiments, that there are lots and lots of free-floating planets in the galaxy? And whether you can imagine a habitable free-floating planet? Sara Seager: First of all, let's just say that that was perhaps one of the miscommunications. The micro-lensing community didn't claim that they were all free-floating, they just said that they're some distance from the star. There’s some distance from the star, but they wouldn't be able to tell if there was a star or not. We don't know if they are free-floating or not, for one thing. And the one about habitable worlds, there was a paper a number of years ago by David Stevenson that ties back into what we were talking about here, about hydrogen atmospheres. That if indeed you had a really dense hydrogen atmosphere, you could trap heat enough so it could be habitable. You know we don't think we can detect a rogue habitable world, but nonetheless the concept is out there. Eric Ford: And tidal forces could also provide an energy source long after ejection. Sara Seager: Tidal forces with what? Eric Ford: You get it with a moon. Sara Seager: Okay, cool, yeah, great. David Grinspoon: So if a planet was ejected with a moon, then it would have its built-in internal heat source. And its hydrogen envelope could keep things nice and toasty. And the organisms would be perfectly happy cruising the galaxy away from any kind of a star. Yeah. Sara Seager: They probably wouldn't be able to see through their atmosphere to see the rest of the universe, but besides that. David Grinspoon: So they would be solipsistic happy organisms. Yeah. Another question over here? What an exoplanet discovery actually looks like (from transit photometry data). This particular plot represents the planet KOI-2124.01. Audience: My name is Ryan Fortenberry. I just finished my graduate studies at Virginia Tech. My point was to actually follow-up with Linda's point about how we had this difficult time with scientists communicating with individuals. And much of that is the responsibility of the individual themselves. Because, we as scientists have this idea about how things work. We look at evidence, we form a hypothesis, we move things along in this process, and then we analyze data. People don't really analyze data. And we've actually been guilty of doing that much of the time ourselves in things that are outside of our expertise. And so I would like to see what the panelists think of this, as a suggestion to something. The way that people really remember things is from a story. You have something that happens, then the information builds and builds and builds and builds and builds. Then there is this climax and then there's a resolution. And then maybe something else happens along the lines of that type of model. But one of the things that I think would be fascinating, especially as David mentioned with the discovery of exoplanets, instead of saying, "Hey, here's this great thing that's coming along, we found life over here, we found this place, this planet where there might be life." But if we are willing to be part of a story where we don't know what the climax is, such that the story can be told continually. And then we'll find it someday and then we will allow that to resolve so that we can move onto the next story. What about that type of model for communicating habitability of exoplanets? David Grinspoon: So then, so what would the press release say? Ryan Fortenberry: That is a very good point. Maybe a corollary to that is you tell a small story along the way and you don't try to oversell the big story. So when the big story comes along, when we do find microbes on another planet, we're not releasing something about arsenic and DNA on our own planet. That's still really awesome, but the public's like, "Why do I care about this? ", because they are not in that scientific mindset. David Grinspoon: As Linda Billings mentioned, we can still try to make ourselves more media-savvy as scientists. And yeah, we may put out a release that has accurate information and we are not saying anything sensationalist. But still the more we understand the media and what they are likely to do with our stories, the more maybe we can try to hedge and prepare them and manipulate them the best we can to tell the kind of story we want want them to tell. Vikki Meadows: Can I make a comment? The idea of building a story, I think we've been trying to do that in exoplanet science for quite a while. First of all it was like, we discovered the first Jupiters. Or now we are trying to characterize the first Jupiters. This is a step on the path to characterizing the first habitable planet. And we always say a step on the path. And even with the Kepler 22b, well this is a step on the path in finding a habitable planet. And yet the press tends to say, "I don't know anything about your steps. I'm just going to take that out and say this is a habitable planet." So, you know, again to Linda's comment, we have to learn how to stop them from jumping ahead in the story and assuming we have just gotten to the end already. David Grinspoon: Unfortunately we have a free press. They can say what they want.